Sparrows was considered a departure from the type of film Mary Pickford had been traditionally making because of its "Dickensian" (this was the adjective most often used to describe it) atmosphere. It even received some criticism at the time, some considering it too heavy-handed for our little Mary. Variety complained, "There isn't a ray of brightness. For once Pollyanna is submerged, smothered and muffled in sinister gloom. There are reeks of agonies, and the cumulative effect is oppressive." Also, audiences apparently preferred Mary's previous,"Little Annie Rooney," since it outdistanced "Sparrows" in box office receipts. However, "Sparrows" is a good example of how silent pictures had matured by the second half of the twenties. Of all Pickford's films, this one may weather the test of time better than any other. Scott Eyman in Mary Pickford - America's Sweetheart (Donald I. Fine, Inc., 1990), said, "'Sparrows' dates hardly at all and has perennial appeal . . ."
Yes, Pickford did choose to deal with a serious subject which most of us would like to think never existed. In Mary Pickford Rediscovered (Harry N. Abrams and the Academy of Motion Pictures, Arts and Sciences, 1999) Kevin Brownlow notes, "Baby farms were a well-known racket in certain states, and kidnapping held a lot of fear for wealthy parents - especially those in Hollywood. Exaggerated as 'Sparrows' may seem, knowing that the background has its basis in reality makes a lot of difference." But Pickord takes a heart-rending story, gives it the reality it needs to be emotionally compelling, and, at the same time, gives us the humor we expect from one of her films all wrapped in that winning Pickford charm. Praise is continually given to the "look" of the film which most likely owes some credit to the German expressionist style of filmmaking which was so popular at the time. Although all produced on the Pickford-Fairbanks Studio lot in Hollywood, it has realism and contributes in no small share to the emotional impact of the film. Set designer Harry Oliver gets the credit for this achievement which Brownlow refers to as "amazing." 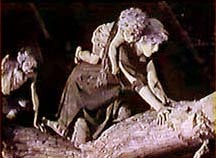 Eyman explained that Oliver "aged the tree stumps with blowtorches, and the entire picture has that netherworld quality of a slightly stylized environment that could only be created in a movie studio" In Pickford: The Woman Who Made Hollywood (University Press of Kentucky, 1997), author Eileen Whitfield says, "The 'Sparrows' set is redolent of mud, muck, snaky vines, staleness, dust and heat. . . Still, for all its creepy details, 'Sparrows' has a strange, almost lurid beauty." It must be mentioned, too, that in speaking of the "beauty" of the film, one very minor, yet moving, sequence seems to epitomize the "beauty" of filmmaking. Little Splutters has been bought by a local farmer. The other children are hidden in the barn as they are ordered to do whenever a visitor comes to the farm. Splutters sits on the back of the wagon waving sadly as he driven off through the gates. We then see a shot of several little hands poked through the cracks in the wall of the barn waving goodbye to their friend. Pickford was good at little bits of "business" such as this. One can't help but wonder how much effect her days with D.W. Griffith had on this aspect of her filmmaking. Although cameraman Hal Mohr had high praise for Oliver's work on the boat chase in the final reel, it is not equal in quality to his work on the swamp set. Mohr recalled, "We had a lake three, four feet deep with two motorboats on it. There was a moonlight chase involved. He (set designer Harry Oliver) took a lot of flax seed, which is oily-looking, and shook aluminum powder on it. Oh, the light shone like hell off it. He spread it two inches deep on a big table, and he carved a model boat, eighteen inches long, which he pulled through it with a concealed string, making a wake. We worked it out to scale, an inch to a foot, and increased the speed of the camera accordingly. I remember I hand-cranked the camera. The effect was marvelous, more like water than water. We were so proud of it." In spite of Mohr's satisfaction with Oliver's expertise, we are still obviously viewing miniatures, which dampen the intensity and suspense the final chase is supposed to generate. However, at the other extreme is the escape of Molly and the children through the swamp. For anyone who has ever viewed the film, the scene where they are crossing a rotting tree limb which has fallen over a swamp full of hungry alligators comes to mind more prominently than any other. The tension builds when the limb keeps cracking and falling a little closer to the open jaws of the alligators as each child crosses it. This is engaging an audience at its best. Even viewing a videotape on a 25-inch screen, the "seat-gripping" impact of the sequence is still there. The legend over the years has been that Pickford took this risk in the interest of great film-making - a legend she herself perpetuated. 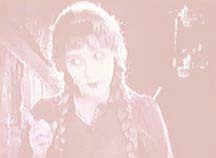 Brownlow, in Mary Pickford Rediscovered, relates some of his discussions with others who took part in the making of the film. All refute that Pickford put herself and the children at risk around live alligators. Cameraman Mohr said the alligators were shot at one time, and Pickford and the children at another time. What we see in the final film is the result of an intricate double exposure. 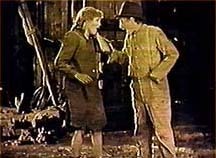 In The Most Popular Couple the World Has Known - Mary Pickford and Douglas Fairbanks (W.W. Norton & Company, Inc., 1977) author Booten Herndon quotes Mohr as saying, "There wasn't an alligator within ten miles of Miss Pickford. Do people think we were crazy?" As for the casting and portrayal of the characters in the story, Pickford does her usual excellent job. However, much credit must go to Gustav von Seyffertitz whose slimey, evil Mr. Grimes is one of the best bad guys to come out of the silent era. In the beginning, we see him read a note from the mother of one of the children. "Dear Mr. Grimes: I been very sick that's why I ain't sent the money regular for taking care of Amy. If I get well I'll send more. I read of a baby farm from where they was mean to children but I know you treat my Amy good." The mother has also sent a small doll which Grimes crushes in his one good hand and drops into the quicksand where it slowly disappears. Another excellent "touch" is when the kidnapped baby is brought to the farm on a cold, rainy night. Molly is called to come to the house and get the baby and take it back to the barn with the other children. However, as she is about to turn and leave, Grimes jerks the baby's blanket away and puts it around his shoulders before sitting down at the table. Molly picks up a dirty potato sack from the floor to wrap around the baby and protect her from the rain before going out. Now, that's mean! Much credit is also due to Spec O'Donnell, who can been seen in many Hal Roach comedies like "A Pair of Tights" in which he shines. He's no less effective in 'Sparrows' as the spiteful Ambrose, Grimes' stepson. Without provovation, he picks up a turnip and throws it against Molly's head. He pulls her picktails and taunts the other children mercilessly. When he realizes Molly has stolen some potatoes, he quickly informs his mother who punishes Molly and the rest of the children by denying their food for the night. At this, Ambrose grins in great self-satisfaction. Even when Molly and the children rescue him from the quicksand, he is not grateful - only quick to get her in trouble with his parents. The New York Times singled out von Seyffertitz as Grimes and Charlotte Mineau's portrayal of Mrs. Grimes for praise. "Gustav von Seyffertitz, with a suspicion of Lon Chaney's penchant for deformity, is emphatically capable as Mr. Grimes. Little as she does, Charlotte Minneau gives an excellent portrait of the cruel and unimaginative Mrs. Grimes." The choice of children was right on target, too. They are charming, spunky, pitiful and adorable while tugging handily at the heartstrings. Mary Louise Miller, who portrayed the good-natured baby who was kidnapped, won everyone's hearts at the time of the movie's release. She was a favorite of Pickford's who said of Miller, ". . . she was sweet-tempered, a trouper, and didn't cry." In later years, Miller referred to Pickford as "beautiful and sweet." As a matter of fact, the two stayed in touch with one another over the years, and Pickford would sign her letters to Miller as "Momma Molly." Of the film, Eyman concludes, "There is notably less comedy in "Sparrows" than was usually the case with Mary's films, but the production design and atmosphere of storybook evil are so strong that it hardly matters." Whitfield said, "The chase in the last reel could perhaps be trimmed. Otherwise, "Sparrows" is horrifically good - a bad dream that wakens to a happy ending, a fairy tale told with brilliant style; a comedy; a Grand Guignol; an expressionist thriller." The New York Times said, "Although Miss Pickford's performance is as flawless as ever, it is doubtful whether she served herself well in selecting this special screen story, in which there is an abundance of exaggerated suspense and a number of puerile ideas. It is an obvious heartstring tugger during most of its length, and it frequently dallies with the thrills of old fashioned melodramas." Considering some of the comments about the film, it would seem that introducing someone to Mary Pickford for the first time by way of "Sparrows" may not be a good idea. However, no other film of hers is more moving, engrossing or memorable than this one. As mentioned, this shows Pickford at the peak of great filmmaking. It will not date like many of her films from the 'teens will, in spite of how good they are. And it certainly is far superior to the lightweight "My Best Girl" which followed "Sparrows." No one should leave the film feeling depressed, as Pickford was a master, just like Chaplin, at intertwining drama and comedy into a complementary whole. 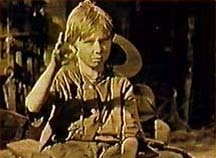 Certainly there is a certain social consciousness that is aroused by this film, but the story skillfully portrays the meanness of Grimes and such a horrible presence in society as baby farms without resorting to an unforgivable act such as tossing a baby into the quicksand - an act we would never accept in this movie. Pickford handles this delicate balance well and pulls it off with aplomb. The film works and works well. Without a doubt, it's silent movie making at its best.